In stock -This product will ship today if ordered within the next 8 hours and 55 minutes. This formula provides a mix of anti-microbial and anti-fungal agents designed to help as part of a programme to promote digestive health. 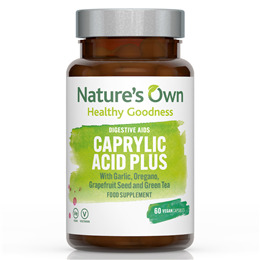 Caprylic acid is natural dietary fatty acid which assists in the maintenance of a normal intestinal micro-flora. The formula also comprises garlic powder, oregano, grapefruit seed extract and green tea extract. Natures Own was born in 1979 out of the desire to help the Bristol Cancer Help Centre with its work. The medical director there wanted purer vitamin and mineral supplements to support people who came to the Centre, with less excipients and fillers, and with a higher grade of materials. Natures Own was created to meet this need and our reputation has grown ever since with the simple philosophy of offering the best possible solutions to nutritional needs. Magnesium caprylate (caprylic acid), capsule shell (vegetable cellulose), garlic powder, oregano extract, grapefruit seed extract, green tea extract. 1-2 capsules daily or take as directed by a healthcare practitioner. Pregnant or breastfeeding women should not take this product unless advised to do so by a doctor. 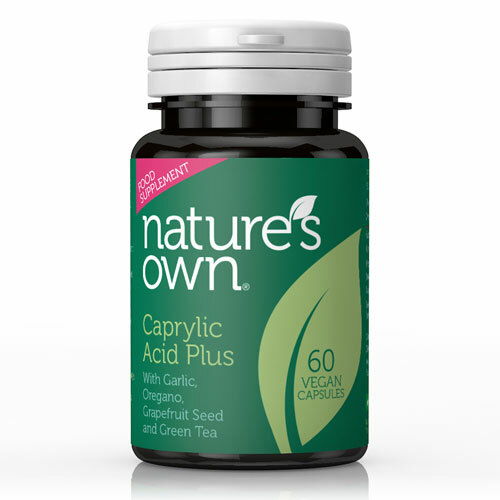 Below are reviews of Natures Own Caprylic Acid Plus - 60 capsules by bodykind customers. If you have tried this product we'd love to hear what you think so please leave a review. Caprylic acid is natural dietary fatty acid which assists in the maintenance of a normal intestinal micro-flora. The formula also comprises garlic powder, oregano, grapefruit seed extract and green tea extract.